A good team. Job done. One of the features of a boat that was launched in 1988 is that any fittings that haven’t already been replaced are now over twenty five years old. I thought of this yesterday when, the winds having abated, we were able to get a couple of jobs done that had been scheduled for two days earlier. I took the boat down river to Plymouth Yacht Haven. We slipped into a berth beside yachts twice the size of Blue Mistress. In such austere company we seem to be batting above our league. However, let’s concentrate on the job in hand . . . When running rigging is removed for cleaning or replacement, a smaller temporary line – (a ‘mousing’ line), is attached to the end and pulled through to sit in its place. When the time comes to re-rig the line, it is attached to the end of the temporary line and pulled back into position. Simple in principle. But I had made a mistake – yet another one, and used mousing line that was too thin – (the red line in the featured image at the top of the screen). It worked well on all the other lines, but jammed on an old worn sheave for the spinnaker halyard. 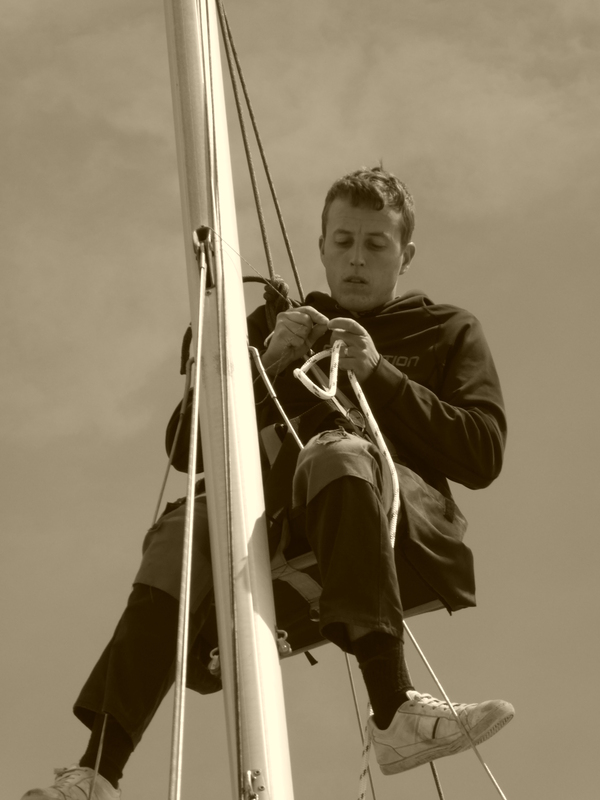 It meant that I could not raise the foresail for fear of breaking this line and creating even more problems trying to re-rig the halyard. Someone had to go up the mast and sort it out. 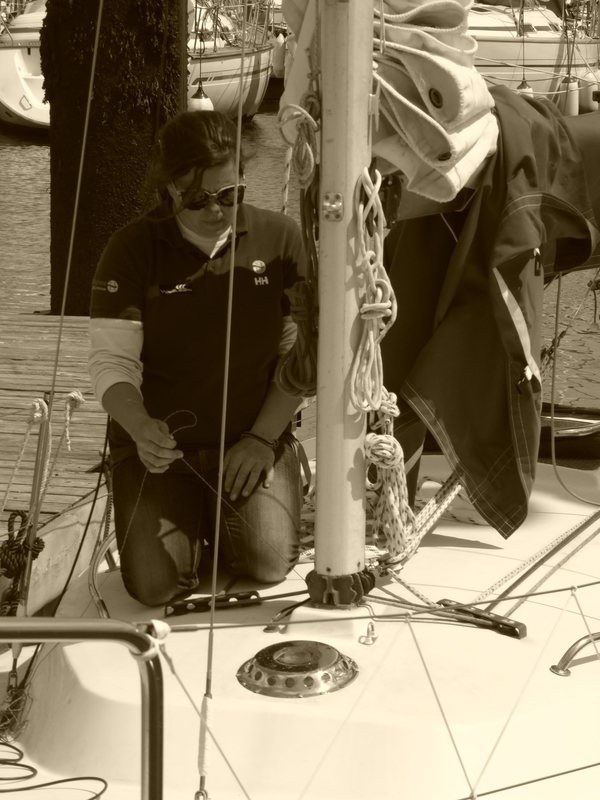 Kate and Jake from Hemisphere Rigging took charge. I was banished to the pontoon. It is at this point that I have to admit to myself my age and my amateur status. 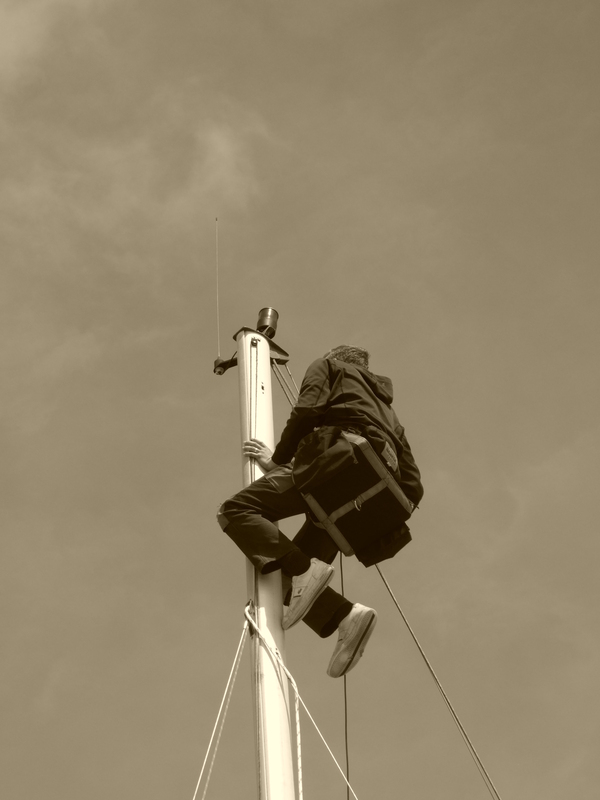 I’d be happy to go up the mast but I wouldn’t be able to do it so quickly or be able to do the job so well. It takes two – one hauling, one climbing. 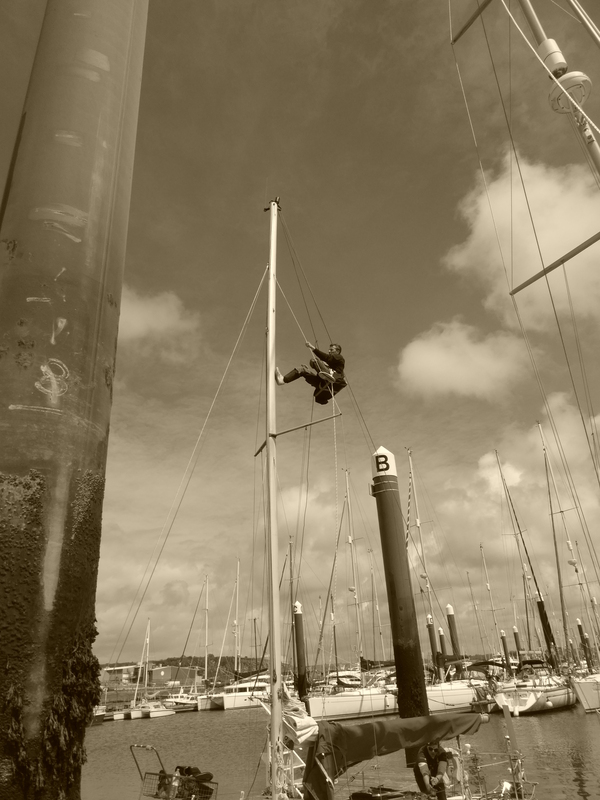 One up the mast to do the job, one to keep him safe. 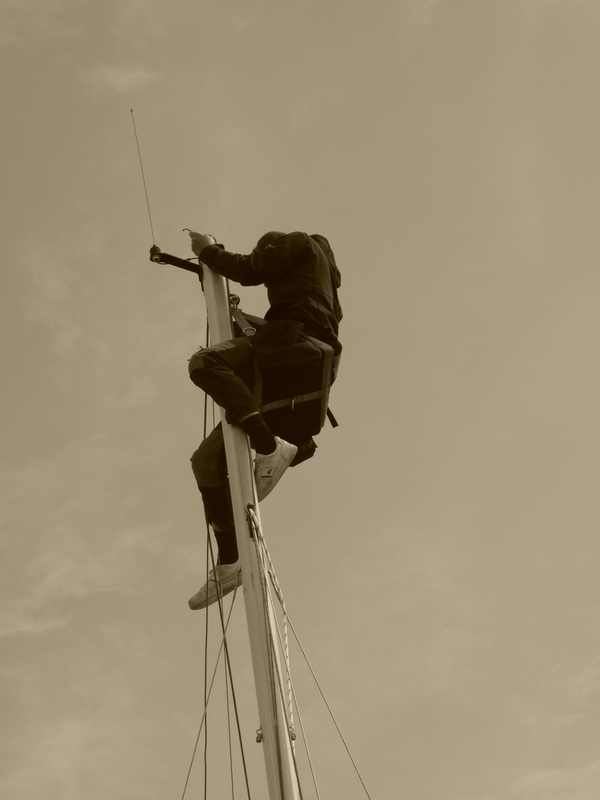 There was another reason to go up the mast. The navigation lights had failed and the unit was decidedly off-centre. It was more than a case of replacing a bulb – the unit itself needed to be replaced. Blue Mistress now has an led tricolour light and anchor light at the top of the mast. All I have to do now is to connect the wiring to the switches correctly . . . hmm, I’ll have to think about that. My thanks to Kate, Jake and Hemisphere Rigging Services for a job well done.